He is a giant in science, period. 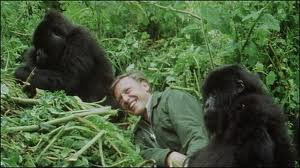 60 years in the wild, chasing animals and delivering breath-taking spectacles to all of us at home, spat at by cobras, groomed by gorillas, and sadly, not all of us recognize his name. 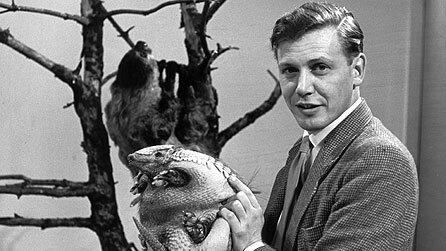 Guardian UK recently published a profile of Sir David Attenborough, and I was really upbeat reading the piece. I have been watching him for as long as I can remember. His voice is hoarse at time, full of grandpa-ish kindness and yet never lacking in authority and power. Narrating a documentary is no simple task. It's not like moderating a game show, where you can crack up silly jokes and act like an imbecile. If you act foolishly in the wild, you could die. A narrator like Sir David must be able to come up with facts at all time. Amazing facts, interwoven with witty jokes, and at the same time teaching viewers the rules of nature. That's why I love watching him so much. So it's natural to assume that this man of nature has never mistreated a single animal in his life, right? Well, during his interview with Robin McKie, he said that he regretted chasing a giant anteater and pulled it by the tail so the film crew could film it. Then there was the time he and his crew were stuck in Borneo and strapped for something to film. "I found a little crocodile and we did a cod sequence with it. We filmed it close up so that it looked like a really big crocodile. I then took off my shirt and jumped on it. Everyone thought I had a fight with a full-sized crocodile. 'God you were brave,' they told me. I wish I hadn't done that." And he admitted to tasting turtle eggs, too. But it's easy to forget how our attitude towards nature has changed over the past 60 years. In the old days when transportation and film equipments were less advanced, documentaries were shot in the old-fashioned way: catch the animal and set up a scene. 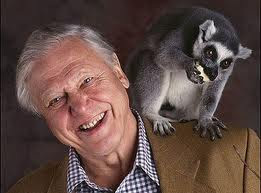 And today, Sir David has a far more respectful attitude to animals. And in my opinion he can be forgiven for those early crimes he has done, because with those disrespectful few early steps he gradually transformed the public mindset on nature. When asked to recommend a spot to give people a chance to enjoy nature at its best, lo and behold, it's not the Galapagos, and it's not the Amazon, Serengeti, nor is it national parks around the world; it's the coral reefs. "People say you cannot beat the rainforest. But that is simply not true. You go there and the first thing you think is: where the hell are the birds? Where are the animals? They are hiding in the trees, of course. No, if you want beauty and wildlife, you want a coral reef. Put on a mask and stick your head under the water. The sight is mind-blowing.....Your first trip to a coral reef will be one of the most transforming moments of your life." 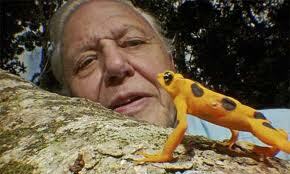 And unlike many immature conservationists I've seen in my life, Sir David addresses the palm issue with wisdom. Instead of excoriating palm countries for clearing up forests for palm plantation, he diverts the blame to the sheer number of human population. And western capitalists. "There is no problem on Earth that could not be solved quite easily if you could reduce world population. The reason that oil palms are being planted all over the place is because there are so many mouths, so many people in the west offering to pay for these forests to be cut down and palms planted for margarine, for plastics." I have to agree with Sir David on this. A small developing country like Malaysia has limited economic resources. Tin has depleted, fossil fuel is going to deplete REAL soon, so we have only forest resources to exploit, which is relatively exiguous anyway. The global rubber market is fluctuating constantly. Tourism is in a mess because we play second fiddle to Indonesia in terms of eco-tourism and Thailand, and when it comes to beaches, malls, and historical places, tourists prefer to visit Phuket in Thailand, Singapore and Angkor Wat in Cambodia. So we are left with palm oil. It is now one of the pillars of Malaysian economy, and hence any restriction imposed on palm plantation could affect the lives of millions of Indonesian and Malaysian. Sir David is also a climate-change proponent. In the final episode of Frozen Planet, he highlighted that summer sea ice cover has declined by more than 30% over the past few decades and is causing major disruptions to the wildlife. His stance was criticized by prominent climate-change denier Nigel Lawson, who claimed that satellite observations have shown that Antarctic sea ice has been expanding over the same period. Despite all the accolades showered upon him, Sir David remains a humble person. And he readily admits his ugly past jumping on animals. This is a man who loves nature with all his heart. More importantly his attitude, passion for nature and wisdom are truly unmatched. So when he talks, you listen.